Combining revolutionary technology, unrivaled drive performance, and comfort, the power wheelchair Invacare TDX SP2 is the perfect mix of customization and functionality that adapts to both your body and all of your mobility needs. Invacare is one of the leading brands in the market when it comes to innovation and design, which is why Orthopedic Service Company is proud to offer its revolutionary mobility products to our customers. Featuring the Ultra Low Maxx and LiNX technologies, users can enjoy a fully optimized driving experience that is meant to ensure the best possible performance throughout the lifetime of the chair. Pairing the power wheelchair Invacare TDX SP2’s superior performance with the reliability of a Motion Concepts Ultra Low Maxx Power Positioning System, users get the most out of stability and comfort, adjusting precisely to what you require. 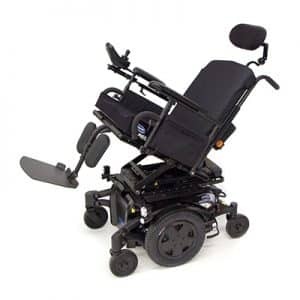 Its thoughtful recline design replicates the body’s natural pivots to provide a full range of motion, while enabling adjustment of common dimensions, such as seat depth, back height, lower leg length and more, so that the wheelchair adapts to you. The industry leading LNX legrests are meant to fit the natural pivot points at the knee, making the leg repositioning natural, smooth and almost silent. Due to the application of the revolutionary LinX technology, the Invacare TDX SP2 power wheelchair is able to understand what’s actually happening as you drive by reacting to how wear and tear alters your wheelchair’s way of driving. Along with the Adaptive Load Compensation (ALC) system, the chair interprets, learns, and adapts to changes in the driving experience throughout its lifetime. At Orthopedic Service Company, we proudly provide our customers with the most innovative and high-quality mobility products. Amongst our wide range of solutions, you can count on us to guide you through the process of searching and finding your perfect mobility vehicle. Contact Orthopedic Service Company today or come visit our showroom. The more we know about you, the better the job we’ll be able to do.